The Karamba online casino celebrates this Christmas with an interesting promotion that allows you to win fantastic prizes, such as an iPhone X or a LG OLED television. 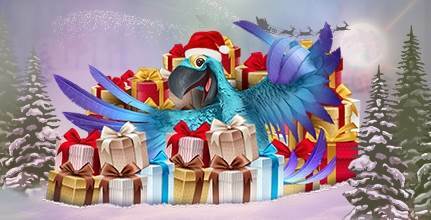 You also have the opportunity to win free spins and you can unwrap a present every day after you log into your player account. The players who collect the most symbols in the weeks between the 4th to the 7th and the 11th to 14 December and manage to make it to the top of the leaderboards will win an iPhone X. The players who collect the most symbols during the promotional period and manages to be on the first place of the leaderboard between the 18th and 21st December will win the LG OLED television. To get the chance to win these prizes at Karamba you will have to have previously made a deposit into your player account. If you are new player you can also get the welcome bonus for your first deposit. What does Karamba casino have to offer? Karamba is a playful online casino with a broad selection of casino games from many different developers, among them NetEnt, ELK Studios, Nyx Gaming, Play'n GO and Microgaming. They currently offer over 250 games, many of which can also be played on mobile devices. The casino also offers many interesting promotions with fair conditions. Another specialty of this casino is also a huge selection of online scratchcards. More information about the casino can be found in our Karamba review. Collect Symbols at Karamba Now!